Children from an extremely young age are able to get themselves into all kinds of trouble; it’s like a magnet to them! Which is why baby proofing your home is so essential. Should You Be Baby Proofing Your Home? Yes, unfortunately, no matter your child’s age they are quite literally a magnet for troublesome situations and can sometimes get themselves into a predicament – no matter how old they are! Your home compared to your child is a big place, full of adventure, things to explore and toys to play with – which is bad news for you. Unfortunately, you cannot control the movements of your child, and they definitely do not like to sit still. So to prevent them from getting into your makeup bag, putting their hands in the toilet or putting themselves in danger you need to babyproof your home. Unsure how? Not to worry, we’ve created a list of things you can do in order to make your home a safe, fun environment for your baby without having to throw anything out – so keep reading! The holy grail of inventions intended for children, some rooms simply cannot be entirely baby proofed. Such as a kitchen or office, there are always going to be devices and off limits possessions in there that you cannot get rid of but that your child is going to want to play with. In this situation, the best thing to do is prevent access from the entire room rather than remove all dangerous things. 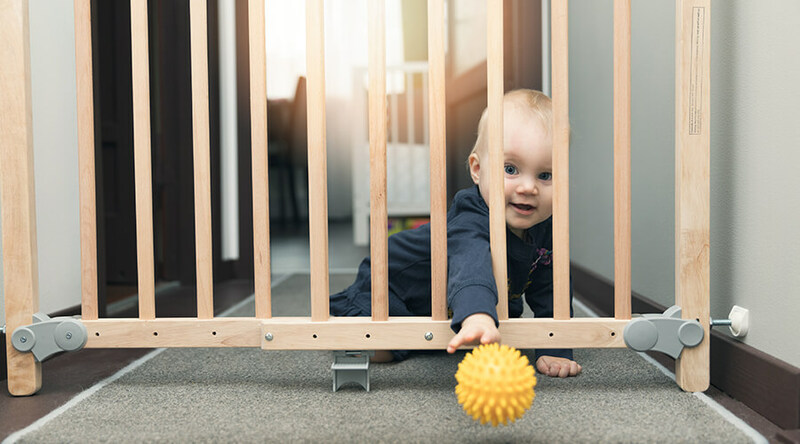 The best way to do this is with a baby stair gate; there are a variety of different stair gates to choose from dependant on your preferences – see below for some examples. Screw fitting stair gate – used at top or bottom of your stairs as well as the entrance to rooms. Requires screwing fixtures into the walls so may need additional installation tools. Pressure fitting stair gates – easy to fit, expand until fitted to the width of the doorway. These stair gates should not be used at the top of stairs. Autoclose baby gate – this gate does precisely what it says on the tin, once opened it will shut and locks down as soon as it has been opened in order to give you extra peace of mind. When choosing a stair gate perfect for you, you should always take into consideration the size and layout of your home, as well as the age of your child. For some strange reason, sharp corners of coffee tables, desks and even drawers seem to magnetise themselves to a baby’s tender little head. I’m sure there have been plenty of occasions your child has suffered a bump to the head while running or from standing up too close to an item of furniture. And these table edges are solid and very sharp, so with serious force have the potential to cause severe harm to your child. Edge corner cushion covers are the perfect solution to eliminate all of the dangerous sharp corners of the furniture in your home. And the great thing about them is they’re affordable, as well as the fact that they are available in almost any colour so that you can match them to your furniture! If you don’t want coloured corner cover cushions, not to worry. There are clear versions of them, although they are not made out of the same foam material they’re slightly firmer and not as covered. Not everyone is suitable for young children, alcohol and medicines should most definitely be stored out of reach and with a lock on for extra precautionary measures. Whether your off-limit items be stored in a drawer, cabinet or cupboard there are a variety of different childproof locking mechanisms to choose from to ensure that these items can only be accessed by yourself. When left for a long period of time batteries can begin to leak out their battery acid, either from overuse or underuse. A few of your baby’s toys may be battery powered, so be sure to keep a cautious eye on these toys to ensure the batteries have not leaked out of any of your babies toys. Battery acid is toxic, although it’s unlikely that this will happen it’s always better to be safe than sorry. If battery acid does leak from one of your children’s toys then do not panic, you don’t have to throw the toy away as that’s not the issue. Simply wipe the battery compartment with tissue paper and make sure that all of the dried up white powder is gone. Once you have done this you can replace the batteries, and the toy will be as good as new, but if you are worried or this has happened multiple times, then you might want to consider replacing the toy. Electrical wiring is dangerous for both adults as well as children, if you have an office and computer then you might want to take the time to make sure all of the electrical wiring is out of sight as well as reach. Simply because if your baby does somehow find their way in, upon seeing wiring it might be too inviting to play with and tugging and pulling out cords with electrical currents is extremely hazardous. Make Your Home Baby Proof Today! By following these simple steps you can make your home a safe haven for your little one, if your worried about your child venturing into places they shouldn’t then contact builders Milton Keynes for more information about extending your home as a playroom or entertainment area for your child. More often than not, parents use home extensions Buckingham or conservatories as an extra living space for baby or children playrooms. We hope that this article was helpful, if it was then why not share on social media?